This is the number one most over-looked element when styling a sweet/dessert table or on a photoshoot but makes huge difference to the end result. 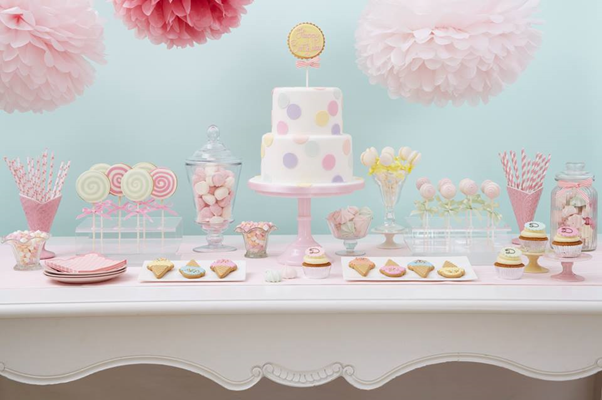 When planning a dessert/sweet table, first of all check out the venue and where the table is going to be located. You could be lucky and have a beautiful antique sideboard at your disposal or a table set under a gilded mirror, in which case you already have the perfect backdrop. Or the sweet table may be situated in front of a bay window with a beautiful view. However, in most cases you will be presented with a bare wall and simple table covered in a white table-cloth, so this will have to be factored into the overall design. One of the prettiest ways to create a beautiful backdrop for your sweet table is to use hanging paper pom poms, and so cheap too ! There are lots of sellers online or, you can easily make your own : pom pom tutorial (http://www.marthastewart.com/265163/pom-poms-and-luminarias-how-to It’s a great way also to bring your colour scheme into focus. Send us your displays to inspire others..
Pom poms paired with a curtain of hanging streamers create a striking sweet table backdrop to your sweet table including giant-sized overlapping paper fans in the background and scattered paper pom poms under the table, arranged in an adorable playful style.